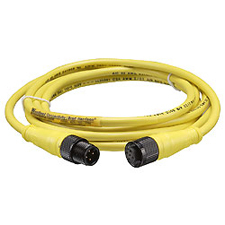 Molex M12 Molded "Reliable Connections"
Micro-Change connectors are designed to withstand harsh-industrial and weather environments with superior quality that assures very reliable connections for control elements in automated equipment. These high-quality connectors allow fast and simple replacement of sensors, encoders, switches and other input and output devices in industrial machinery. Available in 2- through 5-, 8- and 12-pole IEC compliant configurations, single- and dual-keyway designs, with straight and 90° plugs, the Micro-Change comprehensive offering provides a complete connectivity solution. With the introduction of Harsh Duty receptacles, Molex expands the applicability of M12 connectors to more demanding environments, Brad Micro-Change M12 Harsh-Duty Receptacles offer a sealed connection with superior EMI/RFI shielding in high-vibration systems, which makes them ideal for petrochemical, and commercial-vehicle Class 2 applications.